Prepare the jam: Peel onions, cut in half, and slice into 1/4-inch thick strips. Place in a large oven-proof saute pan with a tight-fitting lid. Add the olive oil and salt, cover, and bake in a 400°F oven for 1 hour. Remove from oven, stir, and return to oven, partially uncovered, checking and stirring every 30 minutes until onions are a deep golden brown. Remove from oven and let cool enough to handle. Turn out on a cutting board and roughly chop. Return the onions to the saute pan, together with the port, water, brown sugar and vinegar, and simmer over medium heat until liquid reduces to a thick syrup. Add the tarragon and pepper, and add more salt to taste. Remove from heat and cool. If making ahead, store in an airtight container in the fridge for up to two weeks. Prepare the crepes: Blend the milk, water, eggs, flour, salt and melted butter in a blender at high speed for 1 minute. Scrape down the sides of the blender and make sure all the flour is incorporated. Cover and refrigerate the batter for at least 2 hours or overnight. Heat a small pat of butter over medium heat in a medium-sized nonstick pan. Pour in 1/8 cup of batter, tip and rotate the pan the create a round, thin pancake or crepe. Cook until the bottom of the crepe is golden brown. Flip carefully with a spatula brown the other side. Stack the cooked crepes on a plate and cover with a clean towel or plastic wrap to keep them soft. 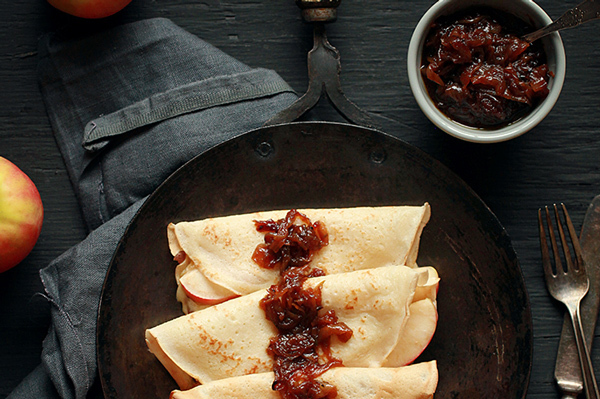 Spread 1 to 2 tbsp of onion jam across the midline of a crepe and place 2 strips of cheese over top. Lay slices of apple end to end to cover the cheese. Roll the crepe into a tube and place in an oven-proof dish. Repeat for remaining crepes. Bake in a 300°F oven for 10 minutes, until the Cambozola just begins to melt. Serve immediately.